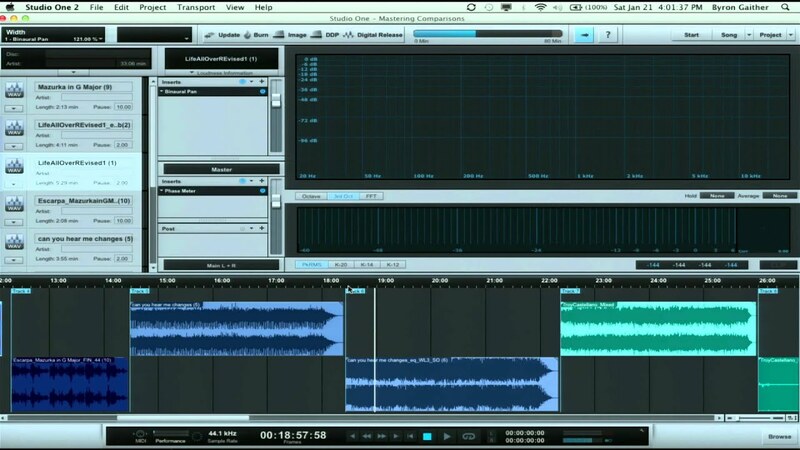 Hi, I recently bought an interface that came with Presonus Artist 1, for the past few years I have been using Cubase LE4 with satisfactory results. Any advantage to switching / installing the Presonus software? In a real general way, all DAW's do the same thing. What is different with most are their plugin packages. They may also have various things you do on a regular basis that are easier in one package and more annoying in another. When I bought my first pro grade interface it came with Cakewalk Sonar, Logic, Acid and Cool Edit. I used Logic (and old windows version) for a month and it was the most poorly named product ever because there was nothing logical about the program. It was as far from imitating an actual analog recording studio as you could get. Much of it was just so far in left field I just couldn't use it very well, even after reading the manual a half dozen times. The plugins were proprietary too and only worked within that program. I Then used Cubase 5, an old version. It was allot better. It was excellent for midi because it seemed to plug and play easily. The two things that did bother me was all the menus were reversed. I kind of blame that on it being a German program and they drive on the left side of the rod in card with the steering wheel on the right instead of the left. That not too hard to get around but it was bass ackwards to other programs like Microsoft office and others so you have to retrain yourself to find certain things. The other thing was its file management. Not sure how the new versions are but the old one was horrific. The track names had weird names and numbers which made finding them more difficult. If I wanted to import a track from some other project I had to go dumpster diving to find it. Cleaning up old projects was difficult too. Allot of manual deletion and you really had to be careful not to delete files belong to current projects. Oh and the other one I hated. You'd have to set your markers for a projected time limit before you recorded and wait for the recording to complete rendering its tracks before you saved the project. Those are all fairly small issues. The program worked well otherwise. Very stable and usable. I moved to using first Cakewalk 7, then 8, then various versions of Sonar. I find it much more intuitive coming from an analog background. The menus are easily editable. Tolls you have little or no use for can be hidden, and stuff you use regularly can be moved to easy reach. Files are named and numbered in a logical easy to read manor. Cleanup consists or deleting the projects picture icon then using a one button cleanup which finds all the individual tracks that belong to that project(s) and you can delete them all in one shot. The plugin manager is pretty good too. as your plugin collection grows you can go in and set up specific bins that leat you find things easily. Last time I went in there I set up new files. I have one that contains most of my chorus plugins, one for compressors, EQ's, Preamps, Echo/reverb, Amp emulators etc. Then when I'm working on a project and need a chorus I click on the folder and all my chorus plugins are there. I can even prioritize their order from the ones I used the most down to the ones I use the least. All these things make it easier to mix. I don't have to drill down through ten folder to find some obscure plugin I want to use, I simply right once and the folders are all right there. There are other things too. I don't have to set up markers, just open a recording file template, hit record, hit stop, give the file a name and hit save. I don't even need to close and reopen another file to start a new project, I simply hit undo recording and I'm ready to record again and so long as I give it a new name afterwards I'm OK.
Its the easiest I've used for recording with a band too. I can use a wireless mouse and keyboard and sit those near my amp and run the DAW from eyes sight distance across the room from the DAW. There are other little things too like being able to change the colors of anything you want like track colors, letterings, buttons, all things that can make it easier to navigate. Oh and the plugin package is pretty darn powerful too. Its got soma fantastic plugs I use daily and the X versions have channel strips. I have others too like Adobe, Pro tools, Reaper and more. Main thing is you try a few out and give them a fair evaluation. See what one does better then another. The end results are essentially the same in most cases. If anything your Cubase is an LE version so you have a limited number of tracks. They give you those stripped down versions in hopes you'll buy their unlocked versions. I definitely play the field before doing that. Being locked into only one version is like only dating one girl them marrying her for life. That may be fine for your love life but its not a very knowledgeable approaching when it comes to getting the best DAW for your needs. I'd try the Presonus since you have it already. I'd also download a copy of Reaper which is a fully functional demo. The licensed version is very inexpensive and the program is very light on resources. There are some other freebies and demos out there too. Shop before you settle into one over another. You don't have to deinstall Cubase or any of the others. You can simply open any one you want when you choose to. You can even do that with various versions. I have 3 different versions of Sonar on my DAW. I have the old cakewalk, Sonar 4, Sonar 8 and sonar X1. X1 will run all the older plugins from the older programs, and it will open up all the older projects I have stored which is pretty handy because you may want to go back and remix them as you get better. Give it a shot. Its not like you're dumping one for another, you simply spend time using both till you know which is best for your needs. Thanks for the in-depth reply. BTW it is Studio1 not Artist, but I am going to load it and see as you suggested. Yea, I haven't tried that one. Its a fairly new DAW program, but those who have used it say its got some decent features. Again, it might be a lite version that tries to get you to upgrade to their full versions. Here's some reviews on DAW programs. Some may have improved since these were done. main thing is to read up on them and compare features. You may not be in the market today to upgrade but if you stick with it either your needs will grow or your curiosity will get the best of you and you'll purchase a full version. Again, I cant tell you where your path may wind up taking you. I record mostly analog instruments. If I was into Midi more or built allot of music from sample I'm sure my path would have changed for those needs. I still read up on even the ones I may not see a reason to buy today because you never know what might come down the road, especially if you take a job in a studio some day, you'll want to have some experience running as many programs as you can - Audio editors too. Guys who do mastering are usually working on stereo mix downs and a good editor program has all the tools you want for creating a professionally finished recording ready to burn to a CD or upload to a radio station. you have to look ahead to where you want to go and pick up the tools you'll need to get there. Starting now will make that job easier. By the way there are some others on this site like Craig and Phil who have some excellent reviews on various programs because they deal with the manufacturers on a professional basis. You can get some guidance form them as well. Check out the manufacturers sites too. They often have forums full of end users and moderators sharing tricks and answering common questions about using the software. I've visited a few when I came across things I wanted to do and needed a few pointers. Don't forget to read the manual either. 99% of the time all the answers you need are there. Last edited by WRGKMC; 07-15-2016, 03:09 PM. Craig Anderton has produced some great how to videos about Studio1. Here's an example (and a little discussion about mastering). Last edited by onelife; 07-15-2016, 03:51 PM. Thanks again for the very helpful advice. I too, record mostly acoustic instruments (hot Jazz) and I usually can get by with 12-14 tracks. I prefer to mike the drums minimally. They bleed into the front line mics enough. Ed < drummereddiegraham.com > Also there are some vids on Youtube from my tours with pianist Earl 'Fatha' Hines.